Lupine is back! She had to take the summer off from scent hurdle racing and other jarring activities because of a limp. Her limp was diagnosed in the spring as arthritis in her left elbow. 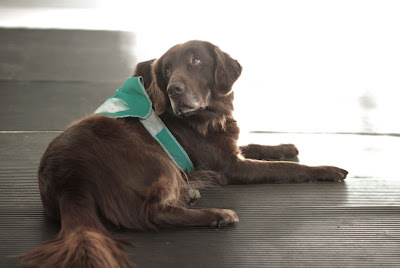 We had a variety of treatments to treat her elbow and also her right shoulder which seemed stiff and sore, possibly as a result of compensating for the arthritis in her other side. We also started her on a joint supplement that did wonders for Tally and Huxley as they aged. By the end of the summer, she was so much better and the arthritis only bothered her if she had overdone things (e.g. a lot of retrieving or more swimming than usual). This fall we haven't seen the limp at all, even after hunting. Our scent hurdle racing team, Due South, competed at the Lethbridge show and Lupine was great - no errors at all. 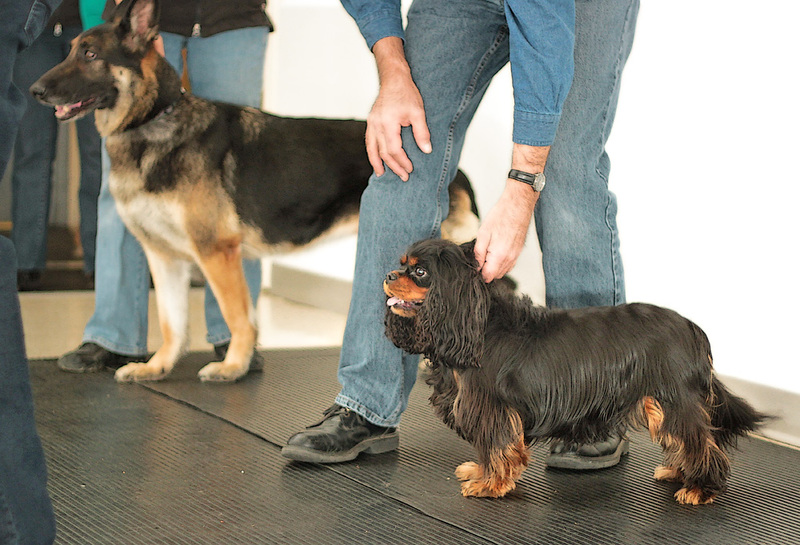 In fact our whole team was amazing, including our newest member, Betty the Cavalier King Charles Spaniel. We are not a particularly fast team as most of our dogs are veterans, but we still managed to place 3rd out of the 6 teams racing. Lupine's daughter, Kona, is now very close to finishing her Scent Hurdle Dog Championship. Lupine racked up 35 points, giving her enough to complete her Scent Hurdle Dog Excellent title. Our newest member of Due South, Betty. This was taken at a practice a few weeks ago (hence no jackets!). 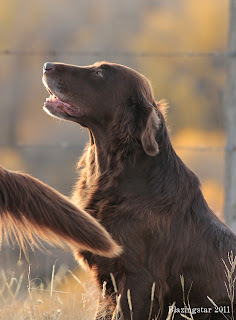 Token, in the background, completed her Scent Hurdle Championship at the Lethbridge show. Lupine waiting her turn at a practice. Kona, with Drummer in the background. 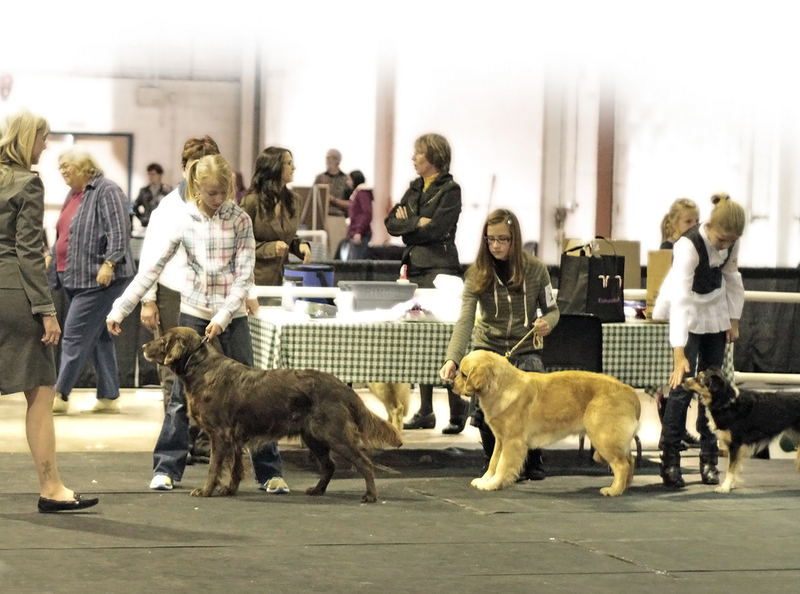 November 18th - 20th was our local dog show put on by the Lethbridge and District Kennel Club. 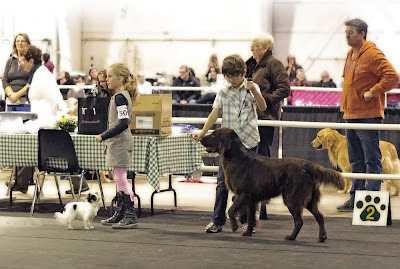 We think it's important to support our local show, so entered all three show dogs as specials. 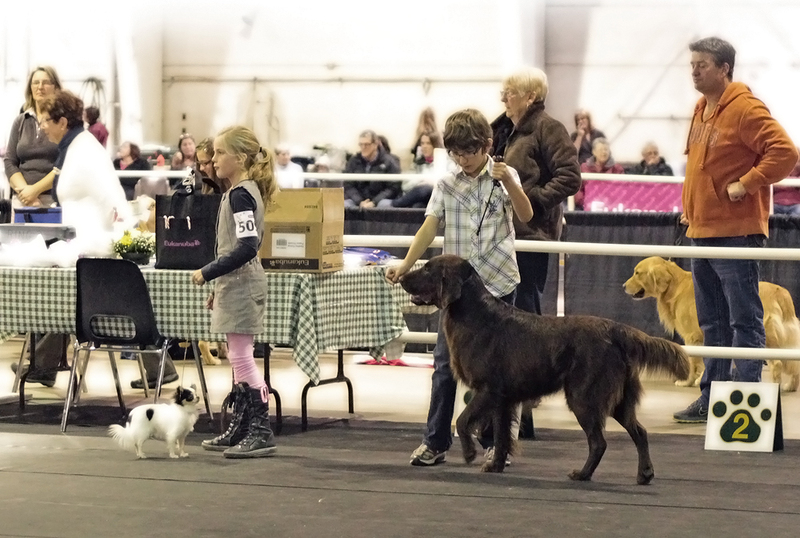 We looked forward to a nice entry of 7 flat-coats, but unfortunately most of them had picked up kennel cough at the Red Deer show and Puffin, Tinbie and Cava were the only flat-coats present. Puffin won best of breed on Friday, Tinbie won best of breed on the Saturday and Sunday. 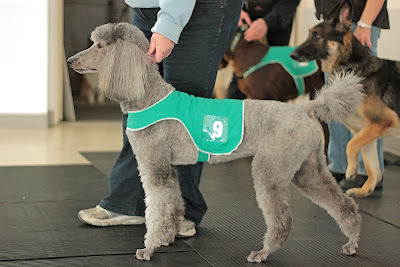 Thank-you to Pat, Julia and Sarah for helping me show the dogs! Perhaps the most fun was watching Tinbie and Lupine compete in the Junior Handling rings with their new young friends, Chloe and Mitchell. Both Juniors did a fantastic job, winning their classes and we got to cheer them on in the final competition! As well as the showing, our dogs had a constant stream of visitors and they charmed the pants off them all (and took the opportunity to clean the faces of many small children). Unfortunately it seems that we did not manage to avoid kennel cough after all - Puffin and Cava came down with it this week, but they are doing alright. 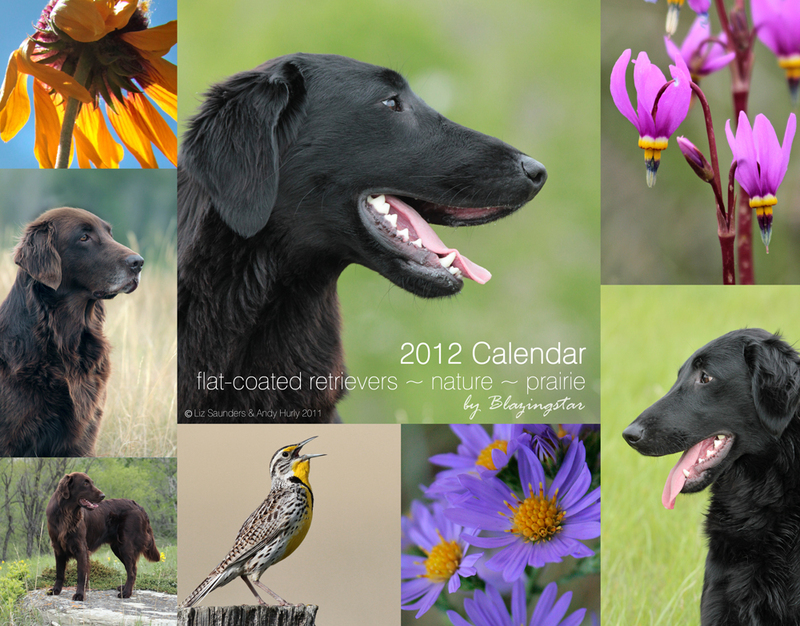 Five years ago we wanted to make a few calendars for us and our friends and family. So we put one together on Cafepress and were very happy with the quality. 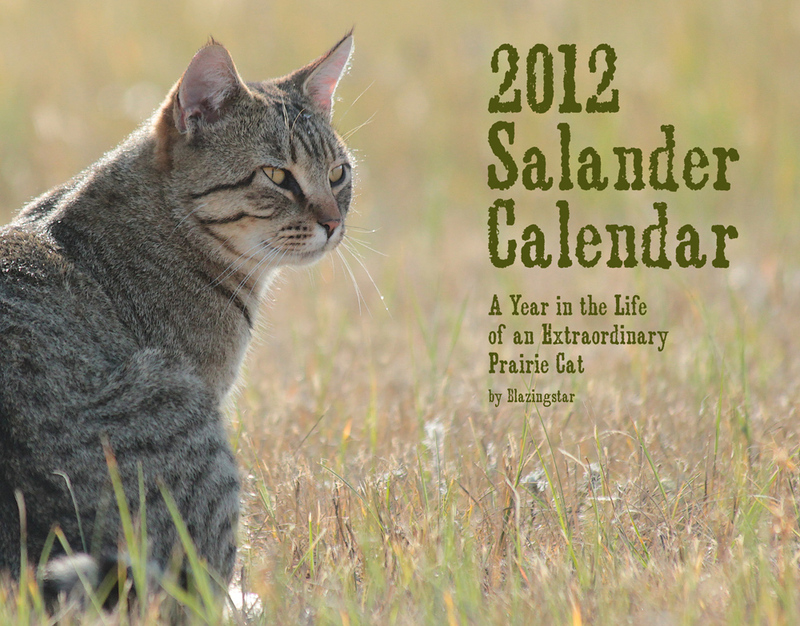 We've continued the tradition and our 5th calendar is now available at our Cafepress store - go to www.cafepress.com/blazingstar. It takes a lot of time and work to put together, but it is also very rewarding to look back over the past year's photos and pick and choose which ones we want to include. Because it rhymes, because we got several requests and because she is just such a cool cat, we made one for Salander too (Salander is the cat that keeps us all in line). Success in Red Deer for the Brown Girls! Three Blazingstar dogs travelled to the Red Deer show (amidst the first major snowfall of the season). On Friday, Teva (Blazingstar Tansley) won Best of Breed for two championship points. On Saturday, Willow (Blazingstar Brown Buffalobean) won Best of Winners for two championship points. Teva gained her 2nd CD leg in obedience and Kona (Ch Blazingstar Brown Coneflower RN SHDX) passed her first Rally Advanced trial. 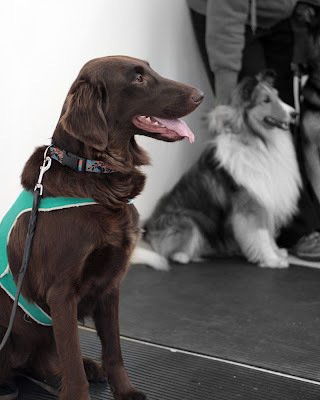 On Sunday, Teva won Best of Winners for another 2 points. What a wonderful weekend for Lupine's liver daughters! We wish we could have been there to cheer them all on, but we are very proud that they were all ably handled by their owners.